Sometimes animals mate with members of another species – here are 5 of the strangest animal hybrids. When a zebra and any type of horse “get it on” their offspring is known as a “zebroid”. Zebroids tend to have the physiology of their non-zebra parent, with zebra stripes covering parts of their body. 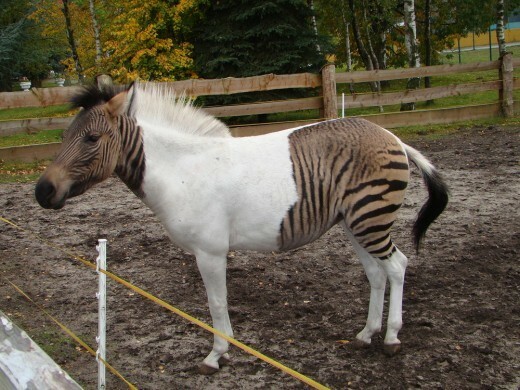 Zebroids are much wilder than a domestic horse and much harder to tame. You wouldn’t think killer whales and dolphins would fancy each other but some do -and when they make love to each other they produce a “wholphin”. Killer whales and dolphins belong to the same family of animals so it’s not quite as weird as you might think, but wholphins are still exceedingly rare. Some animal cross-breeds are purely the product of forced breeding. Its unlikely that a lion and a tiger would ever meet in the wild but they have mated in captivity. And combining the genes of a tiger and lion is potent – as ligers are the largest cat in the world. The worlds biggest liger, Hercules, weighed 922 pounds. Another lion cross-breed is a “jaglion” – the result of a male jaguar and a female lion mating. Jaglions are very rare. The two above were born accidentally at Bear Creek Wildlife Sanctuary in the United States. The product of a lion and jaguar love story. Their parents were rescued and brought to the sanctuary as cubs with weeks of each other. Lolo (lion) and Diablo (jaguar) as they were named were raised together and shared the same enclosure. They became good friends but when they reached maturity their keepers separated them, fearing they might mate. Lolo and Diablo were not happy about this. They became anxious and exhibited signs of depression, Lolo even went on hunger strike and refused to eat. So the keepers reunited them although they temporarily separated them every time Lolo came into etrus. Despite this love found a way and they ended up having these two beautiful babies. Tsunami and Jahzara are believed to be the only jaglions in the world. Cama’s are the product of scientific curiosity and didn’t even exist 20 years ago. In 1998 Dr Lulu Skidmore, a curious scientist at the Camel Reproduction Centre in Dubai wondered what would happen if you mixed a camel with a llama. So using artificial insemination she crossed a female lama with a male dromedary and out popped the first Cama. Since then a further four have been produced.